1. Sauté garlic, onion and green chili. 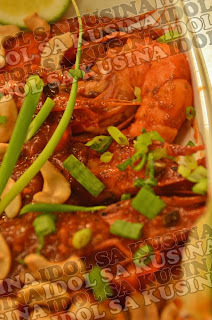 Add prawns, catsup, hot chili sauce and season with salt and pepper. 2. Place on plate and sprinkle on top with cashew nuts and garnish with spring onion.